The poets of Ancient China were writing about their love of nature for centuries. 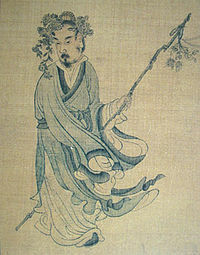 Tao Yuanming (365-427 AD) was a poet of the Eastern Jin period and is known as the founder of pastoral poetry. 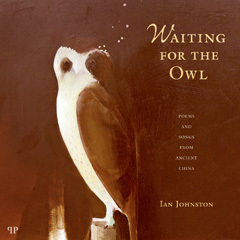 The following fu poem is from Waiting for the Owl: poems and songs from Ancient China, translated by Ian Johnston. Ian is shortlisted for 2011 NSW Premier’s Translation Prize. We’ll know the results on Monday 16 May. My family was poor. Ploughing and planting were not enough to support us. Our house was full of young children but our jars held no grain. I could see no way of making a living. My parents and friends strongly encouraged me to become an official. I had a mind to get away but could see no path to follow. At the time there were disturbances on all sides but the local lord was kind, and an uncle, who saw my poverty and distress, found me a position in a small city. The turbulence of the time had not settled and in my heart I was fearful of distant service. Pengze was a hundred li from my home. Still, the public fields were productive and there was enough to make wine, so I took up the post. Only a few days had passed before I felt a longing to go back home. What to do, then? I have a nature that cannot be curbed or repressed. Even though cold and hunger may be pressing, to go against it makes me ill. To involve myself in the affairs of men is to become a slave to mouth and belly. So I was sad and ashamed to compromise the ideals of my life. Nevertheless, I thought I would try to last out a year and then pack up my things and slip away by night. But then my sister, who had married into the Cheng family, died at Wuchang, and my feelings bade me hasten away. So I took it upon myself to abandon my post. From the middle of autumn to the winter, I had been in the office just over eighty days when this matter directed my heart. I have called the poem ‘Going Back Home’. It was written during the eleventh month of the year yisi (December 405). My fields and garden will be covered with weeds. Why don’t I go back? so why continue in disappointment and lonely sorrow? but I can look towards the future. Truly I have strayed from the path, but not too far. Today feels right, where yesterday felt wrong. my garments flutter, blown too by the breeze. I ask a traveller about the road ahead. then I see buildings and run forward with joy. my little son waits by the door. but pines and chrysanthemums still stand. where a full jug of wine waits ready for me. glance at the trees in the courtyard, and smile. and think how easy it is to be content with little. Each day a walk in the garden completes my joy. Although there is a gate, it is always closed. and sometimes lift my eyes to marvel. Clouds, without purpose, drift from the hills. Birds, tired of flight, know when to rest. I walk, pausing to touch a solitary pine. I seek only seclusion and an end to wandering. The world and I remain too far apart. If I ride off again, say what would I seek? and the joy in lute and books dispels care. so there’ll be work to do in the western fields. Sometimes I call for a covered carriage. Sometimes I row my solitary boat. and by steep paths traverse the hills. the brook bubbles up at its source. It is good that everything has its season. and comes to this end. This entry was posted in All posts, Books, Writing about Place and tagged Chinese poetry, Ian Johnston, Pardalote Press, pastoral poetry. Bookmark the permalink.